This article is about a term in Buddhist phenomenology. For the bodhisattva by a similar name, see Skanda (Buddhism). Skandhas (Sanskrit) or khandhas (Pāḷi) means "heaps, aggregates, collections, groupings". In Buddhism, it refers to the five aggregates concept that asserts five elements constitute and completely explain a living being’s mental and physical existence. The five aggregates or heaps are: matter or body (rupa), sensations or feelings (vedana), perceptions (samjna), mental formations (sankhara), and consciousness (vijnana). The skandhas explain what is a "being or individual", and the skandhas theory complements the anatta doctrine of Buddhism which asserts that all things and beings are without self. The anatta and "five aggregates" doctrines are part of the liberating knowledge in Buddhism, wherein one realizes that there is no-self, a being is five aggregates, each of which are "not I, and not my self", and each of the skandha is empty, without substance. In the Theravada tradition, suffering arises when one identifies with or clings to an aggregate. This suffering is extinguished by relinquishing attachments to aggregates. The Mahayana tradition asserts that the nature of all aggregates as intrinsically empty of independent existence. The skandhas concept to explain a thing or being is unique to Buddhism among major Indian religions, and is not shared by Hinduism and Jainism which believe that a living being has a soul, metaphysical self. Skandha (स्कन्ध) is a Sanskrit word that means "multitude, quantity, aggregate", generally in the context of body, trunk, stem, empirically observed gross object or anything of bulk verifiable with senses. The term appears in the Vedic literature. The Pali equivalent is Khandha (sometimes spelled Kkhanda). The word Khandha appears extensively in the Pali canon, where state Rhys Davids and William Stede, it means "bulk of the body, aggregate, heap, material collected into bulk" in one context, "all that is comprised under, groupings" in some contexts, and particularly as "the elements or substrata of sensory existence, sensorial aggregates which condition the appearance of life in any form". According to Thanissaro, the Buddha never defined a "person" in terms of the aggregates (Pali: khandha) per se, but "such a notion is expressed by some modern scholars as if it were pan-Buddhist". Thanissaro adds that almost any Buddhist meditation teacher explains it that way, and even Buddhist commentaries from about 1st century CE onwards have explained it that way. In Thanissaro's view, this is incorrect, and he suggests that skandha should be viewed as "functions or aspects" of a sentient being. According to Dalai Lama, skandha means "heap, group, collection or aggregate". Adrian Snodgrass asserts that the term literally means "heap", and the concept refers to the teaching accepted by all Buddhist schools that "the personality is an aggregate of five constituent parts". Paul Williams et al. translate skandha as "heap, aggregate", stating it refers to the explanation of the psychophysical makeup of any being. Damien Keown and Charles Prebish state skandha is phung po in Tibetan, and the terms mean "collections or aggregates or bundles", and in the context of canonical Buddhism the concept asserts that "the notion of a self is unnecessarily superimposed upon five skandha" of a phenomena or a living being. Johannes Bronkhorst renders skandha as "aggregates", stating that the meaning and importance of the concept is in explaining the non-self concept in Buddhism. The Buddhist texts assert the five aggregates are what there is to a person and personality, and in each skandha – body, sensations, perceptions, mental formations and consciousness – there is emptiness and no substance. "form" or "matter"[lower-alpha 1] (Skt., Pāli रूप rūpa; Tib. gzugs): matter, body or "material form" of a being or any existence. Buddhist texts state rupa of any person, sentient being and object to be composed of four basic elements or forces, that is earth (solidity), water (cohesion), fire (heat) and wind (motion). "perception" (Skt. संज्ञा saṃjñā, Pāli सञ्ञा saññā, Tib. 'du-shes): sensory and mental process that registers, recognizes and labels (for instance, the shape of a tree, color green, emotion of fear). "mental formations" (Skt. संस्कार saṃskāra, Pāli सङ्खार saṅkhāra, Tib. 'du-byed): '"constructing activities", "conditioned things", "volition", "karmic activities"; all types of mental imprints and conditioning triggered by an object. [lower-alpha 4] This skandha includes any process that makes a person initiate action or act. The initial part of the Buddhist practice is purification of each of the above "five aggregates" through meditation and virtues. Ultimately, the practice shifts to considering these as naive, then transcending them to reach the state of realization that there is neither person nor self within, or in any other being, states Harvey, where everyone and everything is without self or substantiality and is a "cluster of changing physical and mental processes". David Kalupahana clarifies that the individual is considered unreal but the skandha are considered real in some early Buddhist texts, but the skandha too are considered unreal and nonsubstantial in numerous other Buddhist Nikaya and Agama texts. Understanding suffering: the five aggregates are the "ultimate referent" in the Buddha's elaboration on dukkha (suffering) in his First Noble Truth: "Since all four truths revolve around suffering, understanding the aggregates is essential for understanding the Four Noble Truths as a whole." Clinging causes future suffering: the five aggregates are the substrata for clinging and thus "contribute to the causal origination of future suffering". Release from samsara: clinging to the five aggregates must be removed in order to achieve release from samsara. [iv] in brief, the five bundles of grasping-fuel (upadana-skandha) are painful. The fourth category of Dukkha consisting of "five bundles of grasping fuel", states Harvey, are the "five aggregates" that form a person. Each aggregate is an object of grasping (clinging), at the root of self-identification as "I, me, myself". All five are phenomenon that formulate a sense of personality, and they trigger suffering, pain or unsatisfactoriness. Everything that makes a person is a factor of dukkha, and these in Buddhist thought are not a source of pleasure but of sorrow. Nirvana requires transcendence from all five skandhas and the sense objects. Each of the five skandhas trigger clinging asserts "Satipaṭṭhāna Sutta", and the delusion of identifying "I, mine, myself" through that skandha. This clinging creates karmic imprints that lead to rebirth and more Dukkha. This ceases when this clinging ceases, no more karma is being produced, and rebirth ends. The Buddhist scriptures assert that all five skhandhas have three characteristics often called ti-lakkhana (tri-lakshana, three marks). These are Dukkha, Anicca (impermanence) and Anatta (non-Self). Each of the skandhas, states Buddhism, come into being and dissolve (Samsara). This is applicable to all beings and their environs, including human beings, as well as beings who have reincarnated in deva (god) and naraka (hell) realms. Further, states Buddhism, each of the skandhas, a person and every being lacks a self and substantiality. This is the "non-Self" (anatta) doctrine, and it holds that a belief in self is a source of Dukkha (suffering, pain, unsatisfactoriness). Realizing the real nature of skandhas, both in terms of impermanence and non-self, is necessary for nirvana. All form is comparable to foam; all feelings to bubbles; all sensations are mirage-like; dispositions are like the plantain trunk; consciousness is but an illusion: so did the Buddha illustrate [the nature of the aggregates]. The skandha doctrine, state Mark Siderits et al., is a form of anti-realism about everyday reality including persons, and presents an alternative to "substantialist views of the self". It is a Buddhist reductionism of everything perceived, each person and personality as an "aggregate, heap" of composite entities without essence. This 'no essence' view has been a source of sustained questions, major disagreements and commentaries, since ancient times, by non-Buddhist Indian religions, as well as within Buddhist traditions. Another application of the skandha theory in Buddhist texts is in descriptions of the enlightened, perfected state of Arhat and Tathagata. The perfect state of enlightenment is one without any personality, no "I am" conceit, no physical identification, no intellectual identification, no identification in direct or indirects terms related to any of the five skandhas, translates Peter Harvey, because "a tathagata has abandoned the personality factors". The physical, the personality factors (skandhas), and any sense of Self or I are a burden, and the enlightened individual has dropped this burden, thus becoming a "man of nothing", not clinging to anything internal or external. No one can find him because he has no "I", no self and no identity, while his citta expands to infinity; he is beyond the reach of the unenlightened human beings, as well as the army of the Mara (demon of death in Buddhism). While early Buddhism reflects the teachings as found in the Pali Sutta Pitaka and the Chinese Agama, the Early Buddhist schools developed detailed analyses and overviews of the teachings found in those sutras, called Abhidharma. Each school developed its own Abhidharma, the best known is the Theravāda Abhidhamma. The Sarvāstivāda Abhidharma has been preserved partly in the Chinese Agama. The Theravada tradition teaches the "six sense bases" theory, which is understood as six pairs of internal and external sense bases that accommodate "all the factors of existence", it is "the all", and "apart from which nothing at all exists", states Bhikkhu Bodhi. These six sense bases in the Theravada exegesis are an alternative to the five skandhas, but they are corollaries of the skandha doctrine and not an innovation. In this teaching, found in texts such as Salayatana samyutta, the coming together of an object and a sense-organ results in the arising of the corresponding consciousness. The suttas themselves don't describe this alternative. 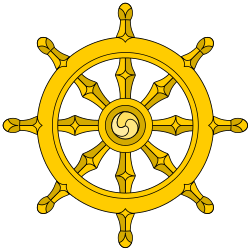 It is in the Abhidhamma, striving to "a single all-inclusive system" that the five aggregates and the six sense bases are explicitly connected. The Maha-punnama Sutta, also called The Great Full-moon Night Discourse, describes the impermanence of the aggregates to assert that there is no self, and the right discernment is, "this is not mine, this is not my self, this is not what I am". [lower-alpha 10] This Maha-punnama Sutta theme is retained in the Theravadin six sense bases exegesis, states Bhikkhu Bodhi, which sum up the conditioned existence as "the all" of the sense bases, and that the "six bases are empty of a self and of what belongs to the self". The first five external sense bases (visible form, sound, smell, taste and touch) are part of the form aggregate. The mental sense object (that is, mental objects) overlap the first four aggregates (form, feeling, perception and formation). The first five internal sense bases (eye, ear, nose, tongue and body) are also part of the form aggregate. The Abhidhamma and post-canonical Pali texts create a meta-scheme for the Sutta Pitaka's conceptions of aggregates, sense bases and dhattus (elements). This meta-scheme is known as the four paramatthas or four ultimate realities. The Twelve Nidanas describe twelve phenomenal links by which suffering is perpetuated between and within lives. According to Schumann, the nidānas are a later synthesis of Buddhist teachings meant to make them more comprehensible. Comparison with the five skandhas shows that the chain contains logical inconsistencies, which can be explained when the chain is considered to be a later elaboration. This way it is explainable that nāma-rūpa in consciousness in the nine-fold are the beginning or start, while in the twelve-fold chain they are preceded by ignorance and formations. Those can only exist when nāma-rūpa in consciousness are present. Schumann also proposes that the twelve-fold is extended over three existences, and illustrates the succession of rebirths. While Buddhaghosa in Vasubandhu maintains a 2-8-2 schema, Schumann maintains a 3-6-3 scheme, putting the five skandhas alongside the twelve nidānas. The Mahayana developed out of the traditional schools, introducing new texts and putting other emphasises in the teachings, especially sunyata and the Bodhisattva-ideal. whatever is emptiness is form." The same is true with feelings, perceptions, mental formations and consciousness. The Madhyaka-school elaborates on the notion of the middle way. Its basic text is the Mūlamadhyamakakārikā, written by Nagarjuna. Nagarjuna refuted the Sarvastivada conception of reality, which reifies dhammas. The simultaneous non-reification of the self and reification of the skandhas has been viewed by some Buddhist thinkers as highly problematic. The Yogacara-school further analysed the workings of the mind, and developed the notion of the Eight Consciousnesses. These are an elaboration of the concept of nama-rupa and the five skandhas, adding detailed analyses of the workings of the mind. Sunyata, in Chinese texts, is "wu", nothingness. In these texts, the relation between absolute and relative was a central topic in understanding the Buddhist teachings. The aggregates convey the relative (or conventional) experience of the world by an individual, although Absolute truth is realized through them. The Tathāgatagarbha Sutras, which developed in India, played a prominent role in China. The tathagatagarbha-sutras, on occasion, speak of the ineffable skandhas of the Buddha (beyond the nature of worldly skandhas and beyond worldly understanding). In the Mahayana Mahaparinirvana Sutra the Buddha tells of how the Buddha's skandhas are in fact eternal and unchanging. The Buddha's skandhas are said to be incomprehensible to unawakened vision. ↑ In Rawson (1991: p.11), the first skandha is defined as: "name and form (Sanskrit nāma-rūpa, Tibetan gzugs)...". In the Pali literature, nāma-rūpa traditionally refers to the first four aggregates, as opposed to the fifth aggregate, consciousness. ↑ Generally, vedanā is considered to not include "emotions." For example, Bodhi (2000a), p. 80, writes: "The Pali word vedanā does not signify emotion (which appears to be a complex phenomenon involving a variety of concomitant mental factors), but the bare affective quality of an experience, which may be either pleasant, painful or neutral." Perhaps somewhat similarly, Trungpa (1999), p.58, writes: "Consciousness [the fifth aggregate] consists of emotions and irregular thought patterns...."
↑ The Theravada Abhidhamma divides saṅkhāra into fifty mental factors (Bodhi, 2000a, p. 26). Trungpa (2001), pp. 47ff, following the Sarvastivada Abhidharma studied in Mahayana Buddhism, states that there are fifty-one "general types" of samskara. ↑ Peter Harvey, The Selfless Mind. Curzon Press 1995, page 143-146. ↑ In commenting on the use of "consciousness" in SN 22.3 , Bodhi (2000b), pp. 1046-7, n. 18, states: "The passage confirms the privileged status of consciousness among the five aggregates. While all the aggregates are conditioned phenomena marked by the three characteristics, consciousness serves as the connecting thread of personal continuity through the sequence of rebirths.... The other four aggregates serve as the 'stations for consciousness' (vinnanatthitiyo: see [SN] 22:53-54). Even consciousness, however, is not a self-identical entity but a sequence of dependently arisen occasions of cognizing; see MN I 256-60." ↑ Harvey writes, "This is in contrast to saññā, which knows by grouping things together, labeling them. This contrast can be seen in terms of the typical objects of these states: colours for saññā (S.III.87), but tastes (S.III.87) or feelings (M.I.292) for viññāṇa. While colours usually be immediately identified, tastes and feelings often need careful consideration to properly identify them: discernment and analysis are needed." ↑ This conception of consciousness is found in the Theravada Abhidhamma (Bodhi, 2000a, p. 29). ↑ While not necessarily contradicted by the Nikayas, this is a particularly Mahayana statement. For instance, Nhat Hanh (1999, pp. 180-1) states: "Consciousness here means store consciousness, which is at the base of everything we are, the ground of all of our mental formations." Similarly, Trungpa (2001, pp. 73-4) states that consciousness "is the finally developed state of being that contains all the previous elements.... [C]onsciousness constitutes an immediately available source of occupation for the momentum of the skandhas to feed on." ↑ The Pāli word dhātu is used in multiple contexts in the Pāli canon: For instance, Bodhi (2000b), pp. 527-8, identifies four different ways that dhātu is used including in terms of the "eighteen elements" and in terms of "the four primary elements" (catudhātu). ↑ Chart is based on Bodhi (2000a), p. 288. ↑ >Put another way, it is through the five skandhas that clinging occurs. See, for instance, the Samadhi Sutta (SN 22:5) (Thanissaro, 2006b). ↑ The apparent distinctions between the nidana model and the khandha model are reduced when, instead of using the twelve-nidana model of the Samyutta Nikaya, chapter 12 (e.g., Thanissaro, 1997d), one compares the nine-nidana model of the Maha-nidana Sutta (DN 15) (Thanissaro, 1997a) where consciousness conditions name-and-form and name-and-form conditions consciousness. ↑ Bodhi (2000b, pp. 839-840) writes: "Whereas the teaching on dependent origination is intended to disclose the dynamic pattern running through everyday experience that propels the round of rebirth and death forward from life to life, the teaching on the five aggregates concentrates on experience in its lived immediacy in the continuum from birth to death." Perhaps in a similar vein, Bodhi (2000b, pp. 762-3, n. 132) notes elsewhere that, according to the Samyutta Nikaya's subcommentary: "There are two kinds of origin, momentary origin (khanika-samudaya) and origin through conditions (paccaya-samudaya). A bhikkhu who sees one sees the other." ↑ While Red Pine (2004) contextualizes the Prajnaparamita texts as a historical reaction to some early Buddhist Abhidhammas, some interpretations of the Theravada Abhidhamma are consistent with the prajnaparamita notion of "emptiness." ↑ According to Nattier (1992), the Heart Sutra was originally composed in Chinese and later back-translated into Sanskrit. Thereafter, it became popular in India and later Tibet. As indicated in an endnote further below, elements in this translation are not present in Chinese versions of this sutra. ↑ See also Nhat Hanh (1988), p. 1, and Suzuki (1960), p. 26. Nhat Hanh (1988) adds to this first verse the sentence: "After this penetration, he overcame all pain." Suzuki (1960), p. 29, notes that this additional sentence is unique to Hsuan-chuang's translation and is omitted in other versions of the Heart Sutra. ↑ In the Theravada canon, the English word "self-existence" is a translation of the Sanskrit word svabhava. Regarding the term sabhāva (Pali; Skt: svabhāva) in the Pali Canon, Gal (2003), p. 7, writes: "To judge from the suttas, the term sabhāva was never employed by the Buddha and it is rare in the Pali Canon in general. Only in the post-canonical period does it become a standard concept, when it is extensively used in the commentarial descriptions of the dhammas [conditioned mental and physical processes] and in the sub-commentarial exegesis. The term sabhāva, though, does occur on various occasions in five canonical or para-canonical texts: the Paṭisambhidāmagga, the Peṭakopadesa, the Nettippakaraṇa, the Milindapañha and the Buddhavaṃsa." Gal (p. 10) speculates that the use of the term sabhāva in the Paṭisambhidāmagga might be the earliest occurrence in Pali literature and quotes (p. 7, esply. n. 28) from this text (Paṭis. II 178) the application of the phrase sabhāvena suññaṃ (Pali for "empty of sabhāva") to each of the aggregates — at least superficially similar to an application of svabhāva in the Prajnaparamita Hridaya Sutra ("Heart Sutra") cited in this article. ↑ Note that Chinese versions of the Heart Sutra do not contain the notion of svabhava. ↑ "Svabhava" has also been translated as "self-nature" (Suzuki, 1960, p. 26), "separate self" (Nhat Hanh, 1988, p. 16) and "self-existence" (Red Pine, 2004, p. 67). ↑ This type of analysis of the aggregates (where ignorance conditions the five aggregates) might be akin to that described by the Twelve Nidanas. 1 2 3 Thomas William Rhys Davids; William Stede (1921). Pali-English Dictionary. Motilal Banarsidass. pp. 232–234. ISBN 978-81-208-1144-7. ↑ Robert E. Buswell Jr.; Donald S. Lopez Jr. (2013). The Princeton Dictionary of Buddhism. Princeton University Press. pp. 708, 721–723, 827–828. ISBN 978-1-4008-4805-8. 1 2 3 4 5 6 7 8 9 10 Peter Harvey (2013). An Introduction to Buddhism: Teachings, History and Practices, 2nd Edition. Cambridge University Press. pp. 55–59. ISBN 978-0-521-85942-4. ↑ Steven M. Emmanuel (2015). A Companion to Buddhist Philosophy. John Wiley & Sons. pp. 193, 232–233, 421–425. ISBN 978-1-119-14466-3. 1 2 Steven M. Emmanuel (2015). A Companion to Buddhist Philosophy. John Wiley & Sons. pp. 587–588. ISBN 978-1-119-14466-3. ↑ Karunamuni ND (May 2015). "The Five-Aggregate Model of the Mind". SAGE Open. 5 (2). doi:10.1177/2158244015583860. ↑ Charles S. Prebish (2010). Buddhism: A Modern Perspective. Penn State Press. pp. 32–33. ISBN 0-271-03803-9. ↑ Bina Gupta (2012). An Introduction to Indian Philosophy: Perspectives on Reality, Knowledge, and Freedom. Routledge. pp. 90–91. ISBN 978-1-136-65310-0. ↑ Johannes Bronkhorst (2009). Buddhist Teaching in India. Wisdom Publications. pp. 30–31. ISBN 978-0-86171-811-5. ↑ Ven. Analayo, 2006, Satipatthana: The direct path to realization, Chapter 10, Dhammas: The Aggregates, Cambridge, UK: Windhorse. ↑ Brian Ruhe (2005). Freeing the Buddha. Motilal Banarsidass. pp. 92–93. ISBN 978-81-208-1835-4. ↑ David Loy (2009). Awareness Bound and Unbound: Buddhist Essays. State University of New York Press. pp. 63–64. ISBN 978-1-4384-2680-8. ↑ Monier Monier-Williams (1872). A Sanskrit-English Dictionary. Oxford University Press. p. 1141. 1 2 Thanissaro Bhikkhu, Handful of Leaves Volume 2, 2nd edition 2006, page 309. ↑ Dalai Lama (1966). The Opening of the Wisdom-Eye: And the History of the Advancement of Buddhadharma in Tibet. Theosophical Publishing House. pp. 37–38. ISBN 978-0-8356-0549-6. ↑ Adrian Snodgrass (1992). The Symbolism of the Stupa. Motilal Banarsidass. pp. 137 with note 165. ISBN 978-81-208-0781-5. ↑ Paul Williams; Anthony Tribe (2000). Buddhist Thought. Routledge. pp. 42, 48, 58–60, 69–70. ISBN 0-415207002. ↑ Damien Keown; Charles S. Prebish (2013). Encyclopedia of Buddhism. Routledge. pp. 321–322, 382, 844–845. ISBN 978-1-136-98588-1. 1 2 3 Johannes Bronkhorst (2009). Buddhist Teaching in India. Wisdom Publications. pp. 28–31. ISBN 978-0-86171-811-5. 1 2 3 4 5 6 7 8 Peter Harvey (2013). An Introduction to Buddhism: Teachings, History and Practices, 2nd Edition. Cambridge University Press. pp. 56–57. ISBN 978-0-521-85942-4. ↑ David J. Kalupahana (1992). A History of Buddhist Philosophy: Continuities and Discontinuities. University of Hawaii Press. pp. 71–72. ISBN 978-0-8248-1402-1. ↑ Thomas William Rhys Davids; William Stede (1921). Pali-English Dictionary. Motilal Banarsidass. pp. 664–665. ISBN 978-81-208-1144-7. ↑ See, for instance, SN 22.79, "Being Devoured" (Bodhi, 2000b, p. 915). ↑ Peter Harvey (2013). An Introduction to Buddhism: Teachings, History and Practices, 2nd Edition. Cambridge University Press. p. 57. ISBN 978-0-521-85942-4. ↑ David J. Kalupahana (1975). Causality: The Central Philosophy of Buddhism. University Press of Hawaii. pp. 85–86. ISBN 978-0-8248-0298-1. ↑ S. N. Goenka (1998). Satipatthana Sutta Discourses (2nd Edition). Pariyatti. pp. 65–66. ISBN 978-1-938754-87-6. ↑ John J. Makransky (1997). Buddhahood Embodied: Sources of Controversy in India and Tibet. State University of New York Press. pp. 320–322. ISBN 978-0-7914-3431-4. ↑ Damien Keown (2013). Buddhism: A Very Short Introduction. Oxford University Press. pp. 32–38. ISBN 978-0-19-966383-5. ↑ Peter Harvey (2012). An Introduction to Buddhism: Teachings, History and Practices. Cambridge University Press. pp. 32–33, 38–39, 46–49. ISBN 978-0-521-85942-4. ↑ David J. Kalupahana (1975). Causality: The Central Philosophy of Buddhism. University Press of Hawaii. pp. 84–86. ISBN 978-0-8248-0298-1. ↑ Peter Harvey (2012). An Introduction to Buddhism: Teachings, History and Practices. Cambridge University Press. pp. 57–62. ISBN 978-0-521-85942-4. ↑ Peter Harvey (2015). Steven M. Emmanuel, ed. A Companion to Buddhist Philosophy. John Wiley & Sons. pp. 34–37. ISBN 978-1-119-14466-3. ↑ Peter Harvey (2012). An Introduction to Buddhism: Teachings, History and Practices. Cambridge University Press. pp. 59–62. ISBN 978-0-521-85942-4. ↑ Clark Johnson (2006). On Buddha Essence: A Commentary on Rangjung Dorje's Treatise. Shambhala Publications. pp. 34–35. ISBN 978-1-59030-276-7. 1 2 3 Mark Siderits; Evan Thompson; Dan Zahavi (2013). Self, No Self? : Perspectives from Analytical, Phenomenological, and Indian Traditions. Oxford University Press. pp. 242–247. ISBN 978-0-19-166830-2. ↑ Kalupahana (1975), page 86. The quote is from S 3.142, and also occurs in the agamas. ↑ Mark Siderits; Evan Thompson; Dan Zahavi (2013). Self, No Self? : Perspectives from Analytical, Phenomenological, and Indian Traditions. Oxford University Press. pp. 247–251. ISBN 978-0-19-166830-2. ↑ Rupert Gethin (16 July 1998). The Foundations of Buddhism. Oxford University Press. pp. 140–149, 238–239. ISBN 978-0-19-289223-2. , Quote: We have seen how Buddhist thought criticizes the concept of an unchanging self as incoherent; however, both ancient and modern critics have argued that to do away with the self in the manner of Buddhist thought in fact creates insurmountable philosophical and moral problems. (...) We have seen how Buddhist thought breaks down an individual into five classes of physical and mental events known as skandhas or aggregates". 1 2 3 4 Peter Harvey (1995), The Selfless Mind, Curzon Press, pages 228-230. ↑ Bodhi 2000b, p. 1122. ↑ Bodhi 2000b, pp. 1121-1123. 1 2 Bodhi 2000b, p. 1123. ↑ Bodhi 2000b, pp. 1125-127. ↑ Bodhi (2000a), pp. 287-8. ↑ Bodhi (2000a), p. 6. 1 2 Red Pine (2004), p.2. ↑ Nhat Hanh (1988), p.1. Again, also see Red Pine (2004), p. 2, and Suzuki (1960), p. 26. ↑ Jinpa 2002 , page 112. ↑ Swanson 1993, p. 373. ↑ Suzuki (1960), p. 29, n. 4. Bodhi, Bhikkhu (18 Jan 2005b). MN 10: Satipatthana Sutta (continued) Ninth dharma talk on the Satipatthana Sutta (MP3 audio file). Sue Hamilton. Identity and Experience: the Constitution of the Human Being According to Early Buddhism. London: Luzac Oriental, 1996.